Inexpensive prints of photos and famous works of art are often made in odd sizes to urge consumers to purchase the pricier finished framed pieces. Those who buy these off-sized prints often discover they have to pay to have them custom framed, which can add up to hundreds of dollars. It is possible, however, to use standard size frames for odd sized prints and display a beautiful work of art for a fraction of the cost. Measure the length and width of entire print. Most prints have the image centered on a white background that frames the piece. Measure the outside edges of that border first and write down the numbers. Measure the length and width of interior square image, and write down these numbers. Match the outer measurements to the closest standard size frame available (for example, 8 by 10, 11 by 14, 16 by 20). If a print measures 15 1/2 inches by 19 inches, choose the 16 by 20. Be sure there is space enough between the glass and the backing for a windowed mat, if you will be adding one. Consider trimming the print if it's only slightly larger than the standard frame. A 16 1/4 inch by 20 1/2 inch picture can easily be cut to fit a 16x20 frame. If the print is an heirloom, very valuable or if you'll be cutting off any part of the image, leave it as it is and choose the next size larger frame. If you do decide to trim the photo, be sure to do it proportionately. Cut the same amount from each side of the print, to keep it centered in the frame. Buy poster board in the same color as the print's border. In most cases, this will be white. For prints that are only slightly smaller than the standard frame, cut the poster board to fit the frame. Center the print on the board and use double-sided photo tape to attach it. The matching color will make the edges imperceptible and the poster board will look like part of the print's white border. Try adding a mat border for a professionally framed look. Use both your center and outside edge measurements to find the closest mat size. Standard size matting may cover some of the picture, but in most cases it won't be noticeable. The print framed here had a center image at 11 3/4 inches by 14 1/4 inches, and an outside edge of 15 1/2 inches by 19 inches. The 16 by 20 inch mat with 11 by 14 opening fit perfectly over the image and into the standard 16 by 20 inch frame. "Woman Bathing her Feet", 1895. Camille Pissarro. Make your own custom matting to avoid covering any part of the image. Buy mat board from an art supply or craft store. Use an X-acto blade to cut the outer edge 1/16 inch smaller than the picture frame size, so it will easily slide into frame. Then cut the center to exactly match the size of your bordered image. Use single-sided photo or archival tape to adhere smaller prints to larger mats to keep them centered in the frame. Look for frames with a built-in mat for one-stop shopping. Just be aware that what looks like matting may be part of the frame. Always check the back of the frame to be sure the opening is large enough to fit your print inside. 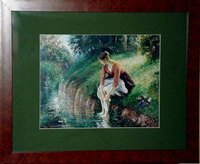 A 16 by 20 size matted frame may only have an 11 by 14 opening in the back. If your print came already matted, you can still use a standard frame. Find one with enough room between the glass and backing to fit another mat over the top, to cover the one that came with the print.